HOW DO PAIN MEDICATIONS WORK? Some people take aspirin or ibuprofen to treat everyday aches and pains, but how exactly do the different classes of pain relievers work? Learn about the basic physiology of how humans experience pain, and the mechanics of the medicines we’ve invented to block or circumvent that discomfort. WILL HEALTH INSURANCE COVER MY CHRONIC PAIN TREATMENTS? The financial aspects of engaging in good quality care and support services for those suffering chronic pain can be daunting, especially for a patient or their family who may already be experiencing financial strain as a result of the injury or the pain itself interrupting the ability to work and earn an income. While there are many different treatment options available, with costs varying greatly, there are a number of incentives and helpful treatment plans that can ease the financial burden on patients and their families. Please raise your hand if you’ve ever thought that it’s impossible to live a full life while suffering with chronic pain? The good news is that living a fulfilling life with chronic pain doesn’t have to be overwhelming. With the right team around you, and the right treatments and management tools at your disposal, you can get back on track and stay on track. Everyone is familiar with pain after an injury but pain that persists and does not go away can be a much more difficult problem to manage. This is also known as chronic pain. Sufferers with chronic pain like this know that it can be frustrating, baffling and exhausting especially when they are told that the ‘scans are normal’ and ‘the pain is in your head’. Chronic pain effects 1 in 5 Australians. We call it the ‘silent disease’ because it can’t be seen or measured. People don’t understand what it is, why it occurs and how it can be managed. 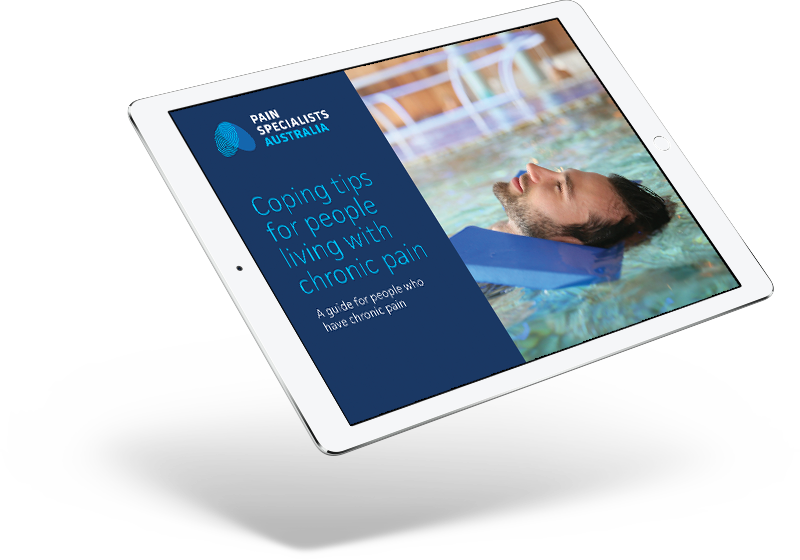 Some great resources to help you understand pain. It is really important when you are looking for answers and explanations about your pain, and what to do about it, that you look to reliable sources of information. This series of articles provides information and opinions that reflects the best current research and the opinions of pain management experts. SBS INSIGHT: OUCH! HOW MUCH PAIN CAN YOU HANDLE? Some of Australia’s top sports people regularly play with and beat pain, including Australian fast bowler Ryan Harris. You will hear from other people, just like you and learn how they too have lived with chronic pain. Take a detailed look at how we feel pain. This focuses on the nervous system and how it works to make us feel pain. How to beat knee pain - BBC documentary. How to beat sports injury pain - BBC documentary. How to beat back pain - BBC documentary. Everyone agrees that pain is a universal human experience.We now know that pain is 100% of the time produced by the brain. This includes all pain - no matter how it feels – sharp, dull, strong or mild and no matter how long you’ve had it. We all know that pain has a lot to do with the brain, watch an entertaining talk to what's going on there from Lorimer Moseley. We think of pain as a symptom, but there are cases where the nervous system develops feedback loops and pain becomes a terrifying disease in itself. Watch a short video to learn about how it works and how to treat it.